If you signed up for Tysons Reporter’s email newsletter via a Facebook ad prior for Memorial Day, you will need to re-subscribe here. 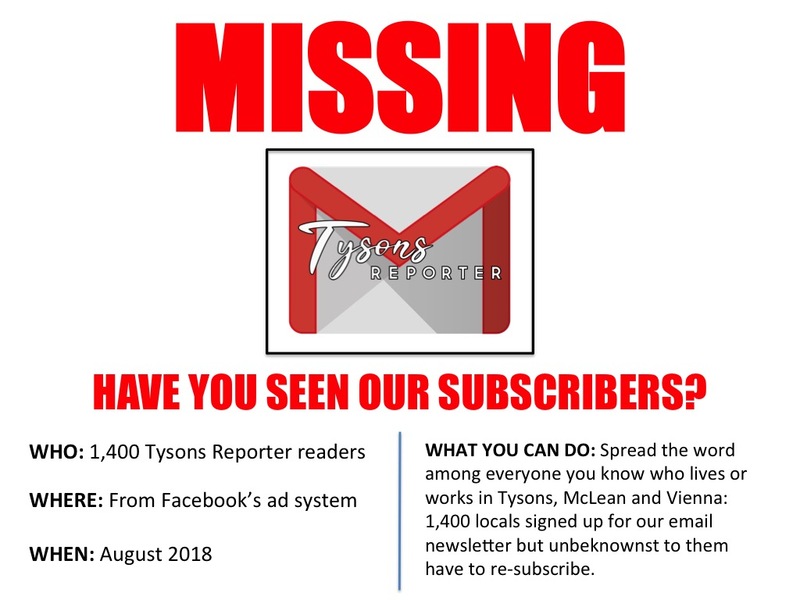 Tysons Reporter will officially launch Sept. 25 — and you’re invited to the launch party — but there’s a big problem: some 1,400 people who tried to subscribe to our newsletter from had their info deleted by Facebook before we could import it into our system. The situation is a bit complex, but was explained in greater detail on our Arlington-based sister site, ARLnow. Bottom line: we need your help us spread the word to anyone in Tysons, McLean or Vienna that if they signed up for the email newsletter via Facebook before June 1, they should sign up again to get their daily dose of local news for Tysons and surrounding communities. You can also use the form below to subscribe. Thank you for your support as we try to overcome this major setback in our mission to bring high-quality daily journalism to the Tysons area.